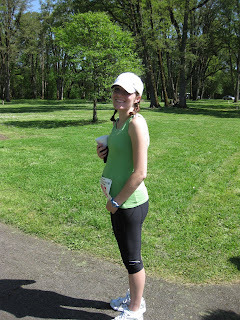 Henstrom Happenings: Almost 30 weeks + half marathon= Great Race! Almost 30 weeks + half marathon= Great Race! I have to admit that I was a little nervous about how this race was going to go. I went into it with the attitude of enjoying every minute, and I did. I did not worry about my time at all and planned on walking if I needed to. To my amazement I did not walk at all, and I felt great the whole time. I feel blessed that I have been able to keep running during my pregnancy. It is a great stress relief for me and I know that it is weird to many but I enjoy it. Now don't think that I enjoy every minute of it all the time, but there is nothing like finishing a run or having a great race. 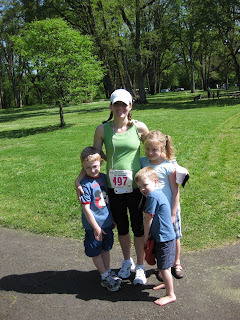 Mike and the kids came and cheered me on and it was fun to see them at different points along the race. The kids always have fun coming to races probably because they get lots of post race treats. Today there were some good ones! Jamba juice, mini cinnabons, soup and rolls. They were in heaven in face, Jackson ate a little too much and had a stomach ache. The weather was beautiful, sunny and warm, but not too warm. My time only 14 minutes slower than my personal best, not too shabby for almost 30 weeks pregnant. Now I am going to go lie on the coach and veg. I don't like posting pictures of my pregnant self but at the request of a sis-in-law I will post one. I am already wishing that I was not posting this picture! I love your cute little tummy (emphasis on the word "little"). Finally on your 4th pregnancy I get to see you in your 3rd trimester. You amaze me that you were able to run that race and do so well. That is totally awesome! Happy Mother's Day tomorrow. We love you. My mouth is honestly hanging wide open. I can't believe you are already 30 weeks (you are tiny) and you were able to run that far. VERY IMPRESSIVE! Good for you! You go! That is so amazing! Thank Steph, you're awesome!!!! You look fantastic, sooooo tiny! I'm so impressed that you ran that and so quick. Love ya and Great job! I cannot believe that you are 30 weeks in that picture! you look like you are barely pregnant! I was proud of myself for running a 1/2 marathon 3 1/2 months AFTER giving birth; I can't imagine doing it less than 3 months BEFORE giving birth. Good for you! OK see....what the freak ever... you are amazing! And the cutest little pregnant lady ever...I am so glad to get to know you....I just adore you. And I am working on getting that cute prego picture blown up for sunday....the world needs to know that you are marathoning it at 30 weeks. Amazing.... just amazing. are you kidding me? like that picture is ANYTHING to be embarrassed about! you look adorable so just stop your whining! i'm SOOOOO jealous that you can run throughout your pregnancies. i wish my stupid body would let me, but it just doesn't, so i'll live vicariously through you i guess. Congrats on getting into St. George. I'm glad you enjoyed your race and everything went well. You look great, about the same size as me, and I am only 22 weeks along. It won't be long now and you'll be back to your tiny self with baby in your arms. Already planning another marathon for this year. St George sounds like a great one. Maybe next year I'll try it as my family lives in St George. Awsome job with the race!! I know you are probably sick of hearing how great your pregnant self looks, but I just have to say this. While looking at your pictures, Anya comes up and says "wow, is she (meaning you)going to have a baby too". I say" Yes, only she is a lot further along then me..she's 30 weeks, and I am 17 weeks". Anya replies " but mom, your way bigger then she is!". Yikes!!! At least I have the excuse it's two right...I just have to keep telling myself that! Seriously you look great...the picture of good health! Steph, you AMAZE me! That is pretty impressive. That is so great that you felt well enough to do it. That little baby girl is going to come out running. Way to go! Good luck these next couple of weeks. We can't wait to see that baby!